COMBAT OUTPOST PAYNE, Afghanistan — When you step off a helicopter at this dusty outpost, you’re immediately asked to recall a hero. 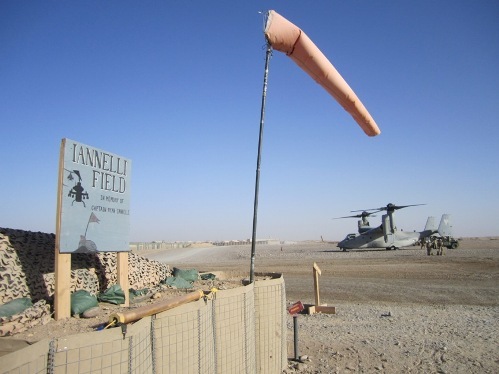 The airfield is named after Capt. Ryan Iannelli, 27, an AH-1W Super Cobra pilot who died here Sept. 28, 2011, following an aviation mishap. As colleague James K. Sanborn outlined in a story early this year, an investigation found that a faulty landing pad led to Iannelli’s Cobra crashing within seconds of takeoff. I snapped the photograph above after stepping off an MV-22 Osprey at Iannelli Airfield last week, when I arrived at Payne. I’ve never met him, but the name of the airfield still hit home for me. As this column points out, the Iannelli family still misses their son badly. I’ve since moved from COP Payne to nearby COP Taghaz, but perhaps you can all take a minute with me to mark the loss of a promising Marine.